A tent city set up to hold immigrant children separated from their parents or who crossed the U.
TORNILLO, Texas (Reuters) - A tent city in the west Texas desert set up to hold immigrant children has expanded its capacity by nearly 10 times to 3,800 beds since it opened in June, officials said on Friday. The facility in the border city of Tornillo sprang up with 400 beds when the Trump administration put into place its "zero tolerance" policy that called for separating parents from children after families crossed the border from Mexico illegally. While officials say Tornillo no longer holds minors separated under "zero tolerance," after the administration rolled back that policy following a public outcry and under pressure from U.S. courts, the facility has grown. It now includes children who crossed the U.S. border on their own. Tornillo houses 1,465 children between the ages of 13 and 17, of whom nearly 900 were detained coming from Guatemala, officials from the U.S. Department of Homeland Security and the Department of Health and Human Services said during a camp tour. "No children that were a part of the family separations are at the Tornillo facility," the Department of Health and Human Services said in a statement. 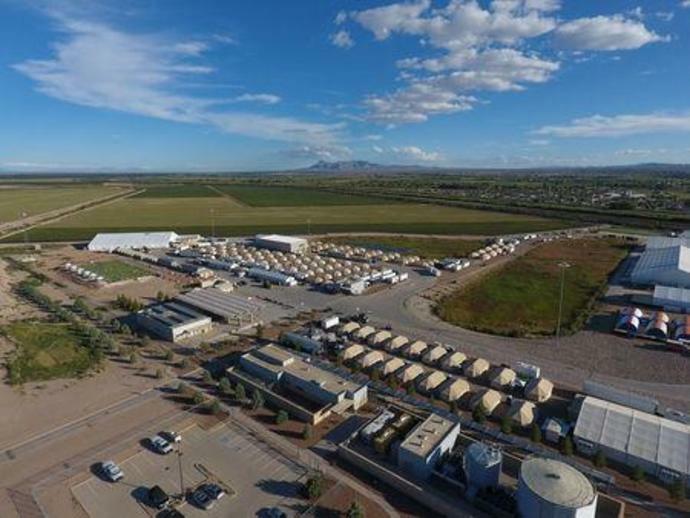 Federal officials would not let reporters on the tour interview children and has tightly controlled access to the tent city in Tornillo, a town of about 1,600 people some 30 miles (50 km) southeast of El Paso. Since it opened, the camp, with air-conditioned tents, has enhanced its amenities to include access to legal services for the children, medical care, soccer, televised sports events and religious services, U.S. officials said. The average stay of a child at Tornillo is 29 days before the child is released to a sponsor, according to Health and Human Services. Civil rights groups have said that no matter what amenities are offered, holding children in a detention facility for prolonged periods can be a human rights violation. Trump administration officials have said the zero tolerance policy, under which some 2,600 children were separated from their parents, was needed to secure the border and deter illegal immigration. President Donald Trump was forced to end the policy after public furor over the separations and the chaotic way in which they were conducted, with hundreds of parents deported without their children. According to a court filing by the government in late September, 136 children separated under the "zero tolerance" policy remain in government custody.